cGAS - The long awaited cytosolic DNA sensor? The detection of viral and bacterial nucleic acids by the innate immune system has become an area of intense research. 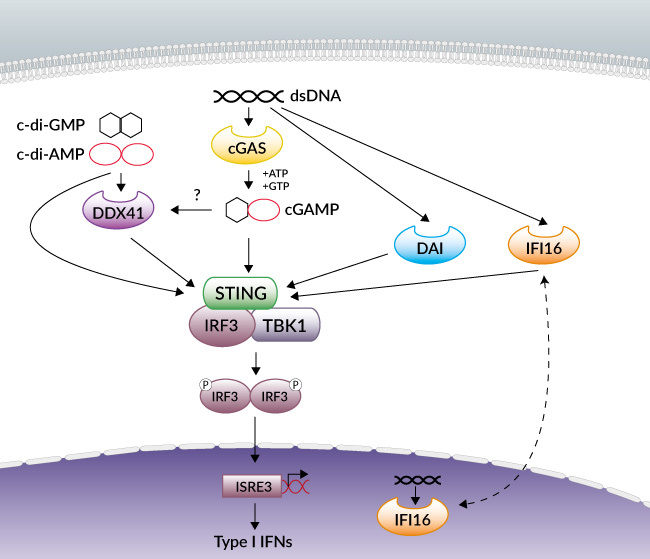 Cytosolic DNA is well-known to induce the production of type I interferons (IFNs) through the STING-TBK1-IRF3 axis but the mechanism whereby it is sensed remains elusive. In two recent articles published in Science, Chen and colleagues describe the discovery of cGAMP, a second messenger that triggers IFN production in response to cytosolic DNA , and cGAS, an enzyme that catalyzes the synthesis of cGAMP and acts as a cytosolic DNA sensor . In the first article, Wu et al. have found that cytosolic extracts of murine cells transfected with DNA, such as ISD or poly(dA:dT), activated IRF3 and that the activator present in these extracts was not a protein, DNA or RNA. Through mass spectrometry, the authors identified cyclic GMP-AMP (cGAMP), the first known cyclic dinucleotide in metazoa, as the activator of IRF3. Further, they have demonstrated that cGAMP binds to and activates STING leading to the dimerization of IRF3. Interestingly, two other cyclic dinucleotides, c-di-AMP and c-di-GMP, which are produced by bacteria, have recently been found to also bind STING . In the second article, Sun et al., describe the identification of the cGAMP synthase (cGAS), a new member of the nucleotidyltransferase family. Using biochemical fractionation and quantitative mass spectrometry, they purified and identified the mouse protein E330016A19 as m-cGAS and the human homolog C6orf150 (also known as MB21D1) as h-cGAS. Expression levels of m-cGAS and h-cGAS in different cell lines correlated with the ability of these cells to produce cGAMP and induce IFN-β in response to cytosolic DNA. cGAS was found to catalyze the synthesis cGAMP from ATP and GTP and activate IRF3 in a STING-dependent manner in response to DNA transfection or DNA virus infection. Further, cGAS was demonstrated to bind to DNA in the cytoplasm and therefore function as a cytosolic DNA sensor. Wu et al. and Sun et al. reveal a novel mechanism by which cGAS senses cytosolic DNA and generates the second messenger cGAMP which binds to STING and activates the STING-TBK1-IRF3 signaling axis leading to the production of type I IFNs. How other cytosolic DNA sensors fit into this process is unclear. Recently, DDX41 was reported to bind c-di-AMP and c-di-GMP upstream of STING . Although controversial, this finding raises the question whether the DNA sensor DDX41 can also bind cGAMP and thus acts between cGAS and STING. IFI16 is another DNA sensor that seems to be a key player in the innate immune response to DNA . What is the role of IFI16 relative to cGAS and the other DNA sensors? Further studies are required and one can suspect that cell-type specificity will be found. 1. Wu J. et al., 2012. Cyclic GMP-AMP Is an Endogenous Second Messenger in Innate Immune Signaling by Cytosolic DNA. Science. 339(6121):826-30. 2. Sun L. et al., 2012. Cyclic GMP-AMP Synthase Is a Cytosolic DNA Sensor That Activates the Type I Interferon Pathway. Science. 339(6121):786-91. 3. Burdette DL. et al., 2011. STING is a direct innate immune sensor of cyclic di-GMP. Nature. 478(7370):515-8. 4. Parvatiyar K. et al., 2012 The helicase DDX41 recognizes the bacterial secondary messengers cyclic di-GMP and cyclic di-AMP to activate a type I interferon immune response. Nat. Immunol. 13(12):1155-61. 5. Veeranki S. & Choubey D., 2012. Interferon-inducible p200-family protein IFI16, an innate immune sensor for cytosolic and nuclear double-stranded DNA: regulation of subcellular localization. Mol Immunol. 49(4):567-71.